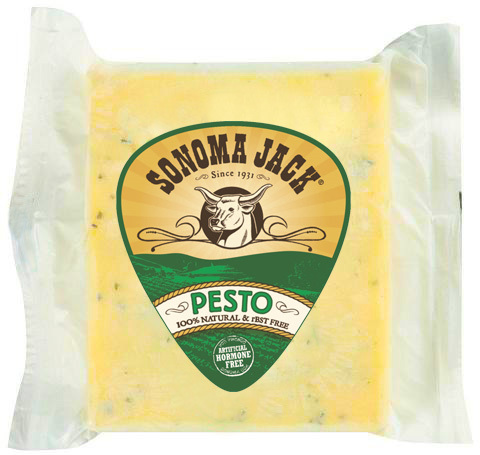 Sonoma Jack 100%Natural Pesto Jack Wedge Cheese #A3032. Great for kids and grown ups as well. You will get the full flavor of the cheese by unwrapping it and allowing it to breathe as well as reach room temperature before serving. This will allow the full aroma of the cheese to develop. 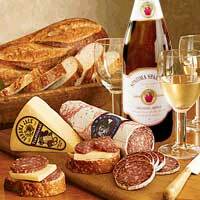 To store our cheese, keep it wrapped and refrigerated. 1- 5.3 oz Wedge of Sonoma Jack Pesto Cheese. *This product is RBST Free. 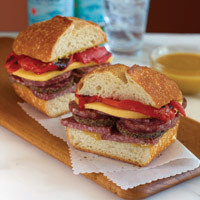 For the perfect Northern California snack, slice Columbus dry salami and Sonoma jack cheese, pile the slices on our original San Francisco sourdough and serve with Sonoma Sparkler Organic Apple Cider.